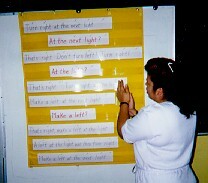 Joanne's Page for ESL Teachers: Ask Marti: Accent Reduction. What is so important about CLAP THE STRESS? I don't have any sense of rhythm, so can I just skip that section of the lesson? Please don't skip it! Accent reduction is the major purpose of this segment. It's very important for many students, especially those who depend on their musical intelligence for learning new things. This exercise teaches only the primary stress on a word, and if the primary stresses are correct, students will be understood. It is essential to use stress, rhythm, and intonation patterns throughout the exercise. If you don't possess it, there is a built-in way that you can make CLAP THE STRESS work for you. Instead of trying to set the rhythm yourself, use the recorded version of CLAP THE STRESS in your class session. It's on the audiotapes that come with Passport to the World of English Just cue it up ahead of time and you're all set. Each dot stands for a syllable. The large dot marks the primary stress. Clap loudly for large dots and softly for small dots. For example, clap the rhythm like this: clap CLAP clap.